Two Iowa Veteran's Ladder Bar Medals, c. late 19th century, a medal with two bars marked "CO. C/2" IOWA.," with a suspended shield marked "VOL. CAV./WAR 1861-5/G.P. 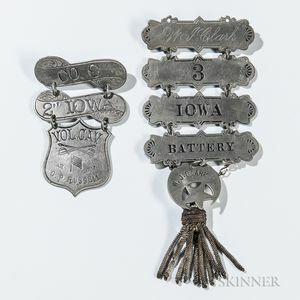 RUSSELL," and a medal with four bars marked "WJ Clark/3/IOWA/BATTERY," with a crescent and star marked "W.J. CLARK," and a hanging gold tassel. Both in very good condition with intact pins on the reverse.